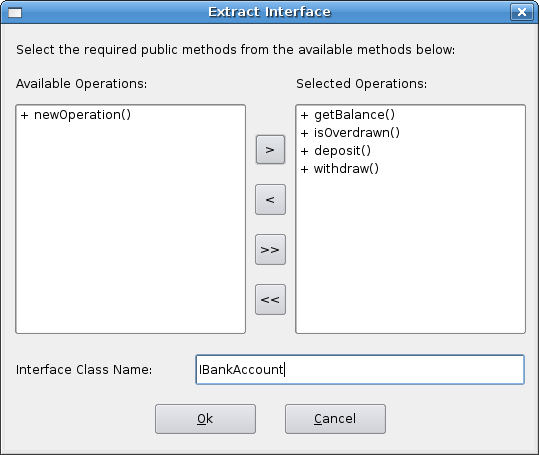 Extract Interface is an open source Bouml plugout to implement the Extract Interface refactoring. This plugout can be applied to a Class. Uncompress the downloaded archive into a folder. Open the extractInterface.prj file using Bouml. Set the generation directory for C++ in the Bouml generation settings. Generate C++ source code and apply "Generate .pro" plug-out on the 'executable' artifact in the "API USER Deployment View". Generate make file by using the "qmake extractInterface.pro" command on linux/unix or use tmake on windows. Configure Bouml to use the plugout for class and class view items as discribed above. The plugout executable is named extractInterface. See the file CHANGES.TXT for TODO items, change history and latest features added to the current release. You can send queries, bug reports, feature requests etc to my email: sulemankm2 at yahoo dot com. This software is distributed under the GNU GPL license and all standard disclaimers apply.